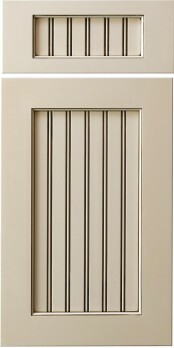 The Lafayette is a traditional five-piece, grooved panel door, found in the Conestoga (CWS) Statesman Collection. This door comes standard with a 2-3/4″ wide framing and uses the G-056 rout. It can easily be customized by adding any of the available framing bead profiles. In order to make this door offering more favorable for use with painted finishes, CWS designed a full MDF (Medium Density Fiberboard) version of this door, which still uses traditional mortise and tenon joints, and called it the Lafayette (MDF). If you were considering the Lafayette but opted for a painted finish, then consider this door.